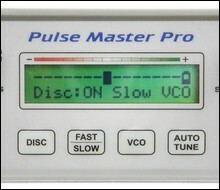 "PulseMaster Pro" is an pulse induction metal detector with LCD display and a graphic display pointing level of signal and discrimination, selected modes and the batteries status. Auto Tune control to earth conditions. Two basic modes - ALL METAL and DISC. Two speed of operation - fast and slow. Two sound indication - one tone or VCO(multy frecuency). Disrimination control. Ability to eliminate undesired objects in DISC mode. Regulation of level of threshold. Automatic elimination of influence of magnetic field of earth. .Built in sto 12V/1,3Ah, providing 12-15 hours continuous work depending on the chosen type of used coil (frame) and volume control.Automatic charge of batteries. Viewing of capacity of batteries while working. Fast and easy approach to all settings. All mentioned advantages allows "Pulse Master Pro" to work very steady in any kind of earth conditions, including heavy mineralized and dirty places! "PulseMaster" can work with search frames 1x1m., 2x2m., coil 22x32cm.and a round coil 45cm. with handle.